We’ve covered Pre-Ride Nutrition a few times before . The carbs. The calories. The timing. 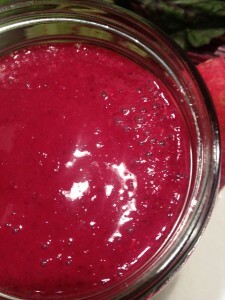 The type of foods (easy to digest, and my preference, liquified into a smoothie). This week, we’re going to add in some advanced ingredients to take your pre-ride nutrition to the next level. I’ve mentioned each of them individual in past posts. In this one, we’ll put it all together for your toughest rides. Instructions: Use these advanced ingredients before important training or races. Before a 3+ hour ride, try pre-ride smoothie with all advanced ingredients added. Finish during 90-120 minutes before the ride.If a shorter ride, use the 16 ounce lemonade/water mix with beetroot powder, 1/8 tsp salt, 2-3 gms beta-alanine & l-glutamine, and 4-6 mg/kg body weight caffeine. Finish drinking 45-60 minutes before the ride. *It’s a great ingredient, but if you hate the taste of beets, don’t ruin your whole pre-ride meal/snack with it. Omit it if you don’t like it! Beetroot powder – Beets increase the bodies nitric oxide, which dilates vessels and allows for better oxygen transport. What’s more it, somehow increases oxygen uptake by the muscles as well. Click here for more information. Salt – especially for those who need more sodium during rides, pre-loading with it can increase blood volume and give you an electrolyte head start. Click here for more information. Specific amino acids reduce muscle fatigue, improve recovery, and even decrease lactic acid affects. For more information click: Beta Alanine, l-glutamine, and BCAAs. Probiotics are incredibly useful for cyclists. Not only do they decrease stomach up set and acid reflux, they also improve nutrient breakdown and VO2 Max! That’s right. Click here for more information. Caffeine can work miracles. It reduces the feeling of fatigue and pain while improving endurance. Click here for all the details. Why stick with status quo when you can go beyond it to advanced? This week, improve your oxygen transport, reduce fatigue, and optimize your performance. Try them all at once or one at a time. Either way, you’re in for a treat! I’m assuming you mean mg/kg on the caffeine? I think 4-6 grams of caffeine is around the lethal dose for most people. Yes! That’s a big-time typo. Thanks for catching it. 4-6 mg/kg caffeine. For a 70 kg cyclist, it would be 280 mg caffeine. I’ve changed it in the text now as well.